Fresh garlic: Cook carefully- the fresh garlic seems to scorch more quickly than dry garlic. Keep an eye on it and remove from heat if it starts to brown at all. Red or Chioggia beets: Roast, peel, quarter, and toss with salt and a little bit of balsamic vinegar. Serve hot or cold. Fennel: Try slicing thin and adding to coleslaw. Carrots: Use promptly while they are still crisp. If you plan to wait a few days, remove the green tops (keep for another use - they are edible!) and store carrots in a bag in the crisper drawer. Thai basil: Stir into a light noodle soup. Cucumbers or Summer squash: Slice the squash thinly and sauté lightly in olive oil with a pinch of thyme until softened. Makes a good toast substitute with your morning eggs. Slice the cucumber and add to a salad or veggie tray. Sugar Snap or Snow Peas: Trim and sauté just long enough to leave them slightly crisp, shake with salt and a little bit of pepper, and serve as a delicious accompaniment to any meal. Baby bok choi: Steam and use to garnish fish. Salad Mix: Makes a refreshing light lunch. Cauliflower: Steam lightly, refrigerate, and make a cool snack with a creamy dip. I love getting salad mix from Harmony Valley. It always comes fresh, clean in a bag, and generally includes some sort of yellow flowers I can eat. I really like eating yellow flowers that have been prewashed. I'm also glad to be getting some cauliflower and cucumbers - it feels relaxing to get stuff I already know what to do with. I can choose to be creative and experimental, or I can just make 'em like I'm used to. I'm a basil nut. We've been eating fresh pesto - my wife is the pesto master - from our garden's basil for weeks now, and I'm glad to be getting more, more, more. 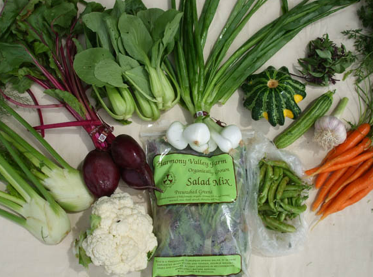 Let me know what you get from your CSA this week and what you're doing with it, please!